MR: What in the world is going on here today? PH: Well, I am here because I love coming to Austin every year for the SXSW music festival. This is my 6th year coming and my 5th year putting on a big event. This year, I'm especially excited because we've been able to raise $45,000 for the VH1 Save The Music foundation. MR: Perez, can you go into that relationship? PH: I had a light bulb moment. I was like, I'm doing this every year, I should also turn it into an opportunity to raise, not just money, but also awareness for a cause that I believe in. Also, as a side by-product, a good thing that came from that was that I can sell tickets, which can be a guaranteed admission to the party. In previous years, a lot of people wanted to go to my party but not everybody could get inside because we always had more people requesting free tickets than there was capacity. Now, people could buy a ticket, get a guaranteed admission, and support music education in America. We've raised over $45,000, which is more than enough money to reinstate a music program in the middle school or high school that has lost their music program. The great thing about music education is that it's been proven that kids who study music in middle school and high school do better across the board. They do better in math, and if it weren't for music and musicians, there would be no SXSW. MR: Nice, exactly. In fact you have been a supporter of new acts for as long as you've been coming here. PH: Absolutely. That to me is what SXSW is all about, it's about new music. It's not about the party, which it's become a lot, and it's not about the brands, which I am thankful for because it allows us to put on the big parties. But I always get frustrated when people say, "Oh there was no big headliner," or "There was no surprise act." Well, there is no surprise act at my party, I'm saying that loud and clear. But I'm also thrilled with my lineup and it does have some established people like B.o.B. and Timbaland, and some newer people that are also established like Devin, and some established people overseas that are really big internationally like Ed Sheeran who's had a couple of number ones in the UK, or Cher Lloyd who's also had some number ones in the UK. And then some young talent I think is phenomenon like Rosi Golan, singer-songwriter in that vain, or Cris Cab -- I see him as a young John Mayer. I'm really excited to present these young talents to four thousand people in my venue, and also the millions of people who read my website every day, because I've been hyping this up for a while now. MR: When you look back at the artists that you've introduced, do you feel proud of the fact that you helped participate in people's awareness of them? PH: Definitely proud because I would never take credit for anybody's success, but I think that I have helped. I remember my first SXSW party in 2008. It was a pretty epic lineup. Back then, I had Katy Perry before she had released her album, before she had released her single. I also had Robyn, and it's been great to see both Katy and Robyn skyrocket and become very successful, especially someone like Robyn who's been able to become very well known in America with little to no radio play. MR: And there's also Kendra. When you're looking at this new batch, are you watching a couple of them and going, "Hmm, I think this one is going to happen pretty big?" PH: I think it's going to happen for everybody performing at my party, and that's why I pick them. I definitely select every single artist performing. I get everybody asking and lobbying, but I genuinely have to really love everybody performing, and I do. MR: Perez, what advice might you have for new artists? PH: I would say it definitely helps if you're in Los Angeles, so move to LA. That's one piece of advice that a lot of people may not give, but I think it's easier trying to start if you're in LA because that's really where the music world has shifted to. It's not New York any more. There's a great music scene in Austin, but if you really want to be seen by the right people and have the right opportunities, you need to be based in Los Angeles. Then again, because of the Internet, anything is possible from anywhere. Unless you get lucky, it's easier in LA, and I'm not saying it's easy either. It's not easy. MR: Lady Gaga... you nurtured a relationship with her. How about these other acts? How personal does all this get for you? PH: It gets very personal. I think I'm like a parent, a dad. I call myself "Papa Perez" to a lot of musicians, and they call me that. I love it because it's more than just supporting these artists. I have relationships with a lot of them and I really care for them, and I give them advice. They ask me for feedback and input and I love that. MR: Do you find that there are common things that they're asking for all the time, when they ask for advice? PH: They ask me to listen to music, to look at photos, look at music videos, everything really. MR: You're going to be doing this a lot longer than this year, right? PH: Oh yeah. This is my 5th year doing this, and I have no intentions of stopping. MR: Are you already looking at the next crop of new talent for next year? PH: I can't plan that far in advance. If you would have asked me a year ago who would perform at the SXSW party tonight, I would not have known because a lot of these artists weren't making headlines, or on my radar last year. MR: So you're psyched for tonight's performances? PH: I am so excited. MR: Thank you very much, Perez. Mike Ragogna: Ian, how are you? Ian Anderson: Well, remarkably well, considering my advanced years and the state of mental degeneration that I was in earlier today when I was starting my couple hours rehearsal of learning the second half of side two of Thick As A Brick 1, if you can grasp all of that. Sometimes, I feel like I'm a little senile, then about ten minutes later, I think I've nailed it. I remember every note now, and it all goes to plan. It's a big job, picking up the pieces of music that haven't been played live for forty years, and then, of course, all the new material which is much fresher in my mind and the minds of the other musicians, because we just finished recording it in December of last year. MR: Regarding Thick As A Brick 2, what was the creative stimulus that got you into wanting to expand the on original Thick As A Brick? IA: Well, after 39 years of steadfastly refusing to entertain any notion of going to a nostalgic revisit of 1972 to do a follow-up of Thick As A Brick, I changed my mind largely because the question was posed, "I wonder what Gerald Bostock would be doing today," Gerald Bostock being the fictitious eight-year-old child, a precocious little bugger who supposedly wrote the lyrics to the original Thick As A Brick. That question... how might he have turned out in life, what various outcomes might have taken place according to decisions to he might have made in his growing years and then adult life, how luck, good and bad, might have treated him. So, that was one question I had, and the other thing was what would have happened to the complete chronicle of the 16-page newspaper that formed a packaging of the original album, what would that be like today? So, of course, it wouldn't be in print media anymore because that stuff just doesn't really sell, so it would be an online community newsletter; simply.com was the fiction, and, of course, is the reality. You can go to www.simple.com and learn about life in the slow lane of middle England. MR: Ian, some analysts or psychologists would say that when we write, when we're having relationships with other people, etc., it's about having it with ourselves. How the child grew up, was there a part of Ian in that child? IA: Well, there's always going to be a little bit of autobiographical content, really. I think it gives authority to something you write, to put a little bit of yourself in there. There are people who put a lot of themselves, or everything is themselves, into their songwriting. That's what makes Alanis Morissette different. She's a heart-on-sleeve person as a songwriter, she's a lovely songwriter and I love her work, but it's very much "I," "Me" kind of music, whereas I'm more a portrait painter. I enjoy writing about other people. I like to create some narrative, people in a landscape, people in a context. Of course, I vest those characters with a little bit of myself, because that gives the authority of the experience. It gives it some credibility, and sometimes, I'm vested with knowledge of other people, not me, but stuff that I know about other people that I'm close to, or people that I know a lot about. There always going to be a little bit of me in something that I write that involves another character. But I draw the line at telling you too much myself. When I sing about Gerald as a gay rent boy, then yes, there's a little bit of me in there, but I haven't ever actually been paid for it. I'm just kidding. When I was a young teenager, my father decided... for some reason, he thought I was gay, or that I was going to become a homosexual. He was really nasty to me about it and it really upset me. First of all, it gave me, I suppose, a better understanding of the gay community -- we didn't call it that, but that's what it was. But maybe it was a good thing, maybe it made me more tolerant and understanding myself. But it hurt me myself, it hurt me a great deal that he used some pretty cruel words to describe me and was obviously fearful, in some awful, stereotypical way, that I was going to become gay. That was upsetting to me. I wasn't sure what I was going to be at that point, I had not really had any experience of girls or boys, and frankly, I didn't really know. I'm not entirely sure even now, except that any chance I might have had to feel another man's bottom is probably going to have to wait a long time because I'm not that attractive to males or females these days. (laughs) But I don't think that I'm gay. My father makes this rather stereotypical decision and it upset me greatly. I'm singing a little bit about my experiences of being, perhaps, a rather artistic child, someone who preferred drawing, painting, reading, and flower-arranging -- not really. But you know what I mean. I preferred the more gentle, artistic side of life to playing sports or fighting with other boys. I don't know what it was, but he got it in his head that I was a puss, I was a Jessie... those are the words I use in the song. I wouldn't use those words if they didn't actually mean something to me. That should be offensive to people if I couldn't give them that authority in the sense that I'm singing about me there, but it's just a little bit of it, I didn't go on to become gay, or a rent-boy. I could've, maybe, if the money had been right. MR: Ian, when you finished Thick As A Brick 2, were there any major revelations about the first Thick As A Brick that you maybe hadn't had before? IA: Well, I had to do quite a bit of personal investigation with the inter-figures of ... Brick 1 to see how far I wanted to make any cross-references between the two. I really needed to understand what I'd written back then, forty years before. I think I was pretty cognizant of it all and I started work on the new album in essentially January of last year. I wrote in a period of three weeks, from one bit of pre-prepared music, which I modified, and utilized something I had written a couple of years before as an instrumental piece, and I brought that into play... the lyrical mood of the whole album. But most of it was written in January of last year and it was something that I think I very knowingly made little references to in the lyrics, and sometimes in musical terms, to the original album. There may be six to eight of them, little deliberate attempts to have little cross-reference moments for those people who pay attention to detail. I know a lot of people who missed some of these moments, they haven't seen them, they haven't heard them. Other people spot them straight away, so I think that's the way that I enjoy. I like making it a little obvious, not so obvious, and that's quite obscure. I would think there are six to eight of those moments on the new album. MR: What do you think about Thick As A Brick's impact on pop culture? IA: Well... it was in 1972, designed to deliberately send up the earnest and self-indulgent bands like Yes and Emerson, Lake and Palmer, the early Genesis, and so on. But I was doing it in a good-natured way, having a little fun with that genre underneath the parody. Parodies, in general, are often comic masks of something of much more serious portent that lies beneath, and I think this album was very much like that. There was a lot of serious stuff embedded in the lyrics of Thick As A Brick -- a precocious young school boy uttering notions of militaristic grandeur, battle between father and son, and all those age-old issues. These are part of what led to a serious underlying narrative through the piece. I think that was an important thing, but as to its impact as for pop, rock, music, or culture, I think it's in there, it's in the mix somewhere -- a brief moment or two at number one on the Billboard charts, and people paid attention to it for a little while. But I don't we think should overstate its importance. It's one of those records that made its impact with a quite clever and creative album cover. I do think that was very much the case. Luckily, I got there just before John Lennon, who presumably had the same idea, and we were both blissfully unaware of each other's efforts until Thick As A Brick came out, and then a few weeks later, John Lennon's album used The New York Times as the cover of his album. It must have been awful for him to be beaten to it, and it was obviously too late to recall the album and change the cover, he had to go with it. Of course, it must have seemed a pretty pale imitation of our more lavish cover. I never spoke to John Lennon about it, so I don't quite know how he felt about it, but I did feel genuinely a little sorry for him. He must have felt bad about it, I'm sure. MR: Great minds think alike? IA: It's easy to say that but with a lot of things, you do think that if you don't manage to get this out, someone else will have come with the idea anyway. In a way, the writing of the piece "Banker Bets, Banker Wins" was a worry because I thought it could be old news or somebody might have really gone there in a really deliberate attempt to sing about the excessive grabbing by the senior executives of the major banking corporations. But it seems that no one has done it in that way. Certainly, the piece wouldn't pass the time about the repatriation of the debt, the fallen British soldiers, male and female, who came back from Afghanistan in coffins. Somebody else might well have gotten there before me, and it would have been awful to come out with that, being a month, two months, or six months later there's somebody who also touched upon the subject of that song. I'm in reasonably good shape, artistically, in the sense that the music does seem to have that credibility of getting there first on a few topics like that, and I don't think anyone has done a piece about the corruption of the over-zealous TV evangelists. I feel good about this, and I go out there on a limb with a few things that it would be very, very difficult to have them be stand-alone songs, because they are a little too edgy, too out there. But as a part of the overall project, they sit into that bigger context of that conceptual thing that it's tied to, they seem to be quite fitting. They are slightly theatrical in their rendition, in the lyric writing and the singing. I'm really looking forward to doing that live on stage, because this is a bit of theatre, this is a bit of the thwarted thespian in me that's rather looking forward to getting out and dramatizing this on stage. MR: One last thing I need from you, please, is advice for new artists. You've had an amazing career. IA: My advice is to do it because you love it. There should be no sense of second best or failure attached to the idea of being an amateur musician. So, my advice to anybody is set out with the idea that you want to do it for you and you want to do it for the love of what you do, that being the latin root of the word "amateur." To be an amateur musician is a very fine pursuit, it's not something that is somehow failure or second best. Don't set out to be a rock star or a pop star to make tons of money, because the chances are it's not going to happen, you're just not going to make it. The depression, the sense of failure attached to starting off with that viewpoint, just not making it, is huge. I think you should do it because you love it, it's fun, it's something you do in your spare time. If it's something you find is turning into a career, and you're getting paid for it against all the overwhelming odds, then that's an added bonus. But do it for yourself, do it because it's fun, do it because you love it. Remember that people like me who do get paid for it spent a lot of the year actually out and about traveling around the world, jumping on and off jumbo jets, riding in limos and whatever we're supposed to do. We have days off when nothing much is happening and what we do, we pick up our guitar or our flute, we do it for fun. Half the days of my typical calendar year, I too am an amateur musician and I'm having a lot of fun, not getting paid for it. MR: Beautiful. Thank you so much, Ian. IA: Nice to talk to you! Mike Ragogna: Ladies! How the heck are you? Wendy Wilson: We are great! MR: I want to ask you about your new album, Dedicated. One day, did any of you just kind of blurt out, "Hey, let's do an album that's more about our families than us"? CW: (laughs) I'm laughing because it's like a no-brainer, and then it's like brain surgery. I'm telling you, it was really not easy to do these songs. For many reasons, it was not easy to do them. First, in the selection process, that was hard, because how do you choose? "Choose your 12 favorites of Beach Boys and The Mamas & The Papas." So how do you do that? That was totally hard. Wendy, why don't you tell him about recording it, that was a challenge, right? WW: Oh, yeah. We had no idea what our parents did in the studio, which means we weren't there, but now that we've done these parts because we had to dissect them, we're so impressed with that. I mean, they probably did it in two takes, and for us, we do it until it's right. So, we're just really enamored with them, and have a new respect for the music. MR: Learning through hands-on experience what your families went through. MR: Not sure if that's ever been done before. And the album being titled "Dedicated" seems exactly right. It's you giving back to your families, isn't it. CW: Yeah, this is a tribute record. It's a tribute to our parents; it's a tribute to that era. It's a celebration of these songs that are just classic songs that are never going to go away, with a few more, not obscure, but songs that are some of our favorites like "Got a Feeling" by The Mamas & The Papas and "I Can Hear Music" and "Do It Again" by the Beach Boys, just kind of out of left field a little bit, but ones that we love. But each song has its own life, and the classic palette of "Don't Worry Baby" and "God Only Knows" is one that just rips your heart out. "Good Vibrations" is something so unique and the way that we did it, in a cappella, was really challenging. So we love how it turned out. The earthiness of the tracks for "California Dreaming" and "Monday Monday," the way that my husband Rob produced the album, the way that he had these guys play these instruments is a very acoustic guitar. There are 12-string guitars that are earthy, but still reminiscent of the records. MR: Of course, the material, considering the combined catalogs, doesn't get much better than this. When you listen back to this album, and maybe even during the recording process, there must be some memories of you listening to these songs for the first time, maybe hearing your parents play them for you? MR: ...well, when you were together with your families, was there ever a sense of dynasty, like your parents would go, "Someday, kid, you're going to do this"? CW: No, not really. I think that we have very clear, distinct memories of Uncle Carl on stage calling out to The Beach Boys kid children that were there, "OK guys, you know you're cute, it's when we sing 'Good Vibrations' and the breakdown part of 'Gotta keep those lovin' good vibrations a-happening with you,' that's your cue." So, we'd be waiting at the side of the stage to run out. All we knew was that the children of The Beach Boys, believe it or not -- Brian's daughters, Carl's sons, Al's sons, and sometimes Mike's kids -- were dying to be on the stage with them. I remember sharing microphones with Carl and him moving over me, and smiling at me trying to sing harmonies! So it was our destiny, and yet at the same time, who knew that it would wind up being with Chynna, when we graduated high school and just started innocently singing harmony on Wendy's carpet. 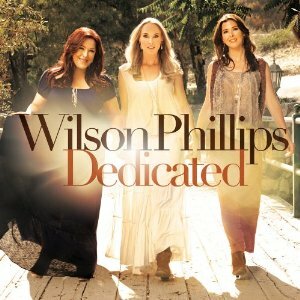 MR: You've probably told this story ad nauseam, but how did Wilson Phillips get together? WW: Well, we were friends our entire lives, we grew up together. One day, Chynna had this idea to do a song for charity with children of the '60s singers. We talked about bringing in Moon Zappa, Owen Elliot, Ione Skye, Donovan Leitch. Ione and Owen Elliot -- who was Cass Elliot's daughter -- we placed some phone calls and nobody was interested except for Owen Elliot. So the four of us sat down and we started singing harmonies together, like Heart songs, Fleetwood Mac, and we started harmonizing, and it sounded really good. That was the genesis of the group and then we took it a famous record producer who said, "Wow, I see visions here. You guys are great." It didn't really work out with Owen at the time, and it just became the three of us, and we just started writing music. The beautiful thing is that Owen is actually singing Cass and Michelle's unison part on the song "Dedicated To The One I Love." Owen is singing that beautiful part. It just reminds me so much of Cass. MR: Looking back at your career, having the song "Hold On" as such a huge record around the world, what are your thoughts about that at this point? Chynna Phillips: Well, I'm very encouraged that we get to tag such weight, and even twenty years later, it seems to have new life. It's really super exciting. Obviously, Bridesmaids really helped put us back on the map and Carnie can tell us, it's so exciting, about the iTunes store. What happened again, Carnie? CW: The downloads on iTunes went up 700%. It was really cool. CP: It's exciting. It's nice to know that there's a whole new generation of listeners, you know? It's unbelievable. I think that lyric and that melody together is something that happens a couple times in a person's career if they're lucky. MR: What is your advice to new artists? CW: Advice for new artists? Wow, it's a different time, a different world for music, but never forget why you make music. WW: I would say don't be afraid to be original. Go with your instincts and don't try to be a carbon copy of anyone else. MR: Thank you so much for joining us, and all the best with your new album Dedicated, which, of course, is dedicated to the ones you love. All: Thank you for having us!